Valentine’s Day is only a few weeks away and it’s time to start thinking about spoiling that special someone in your life! 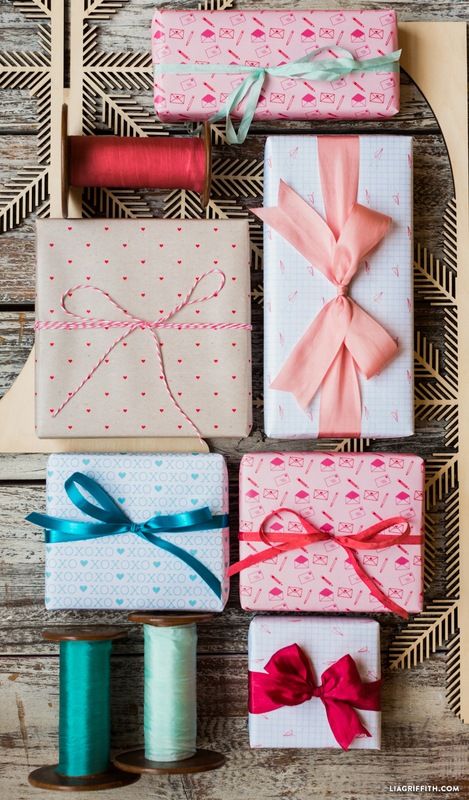 Once you find your perfect present, whether it be store bought or handmade, you’ll need to dress it up with some cute Valentine’s Day gift wrap. 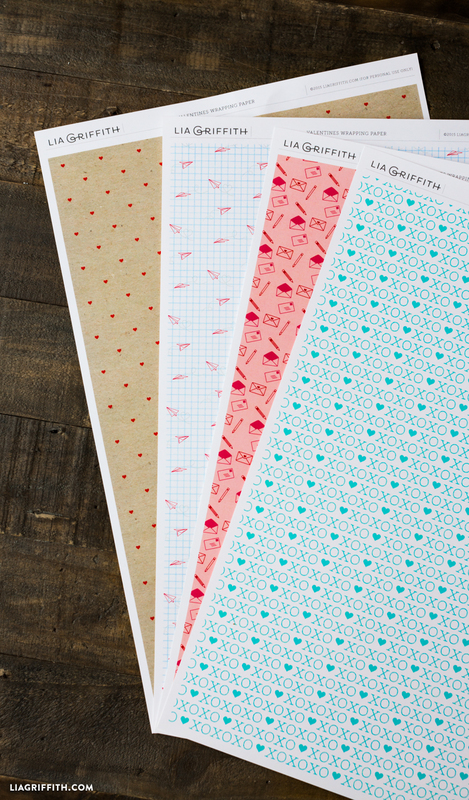 Use these four adorable printable Valentine’s Day gift wraps to make your gift extra special. If you loved our Valentine’s Day themed paper airplanes, then you will be glad to see that we took inspiration from that design to make these sweet wrapping papers! 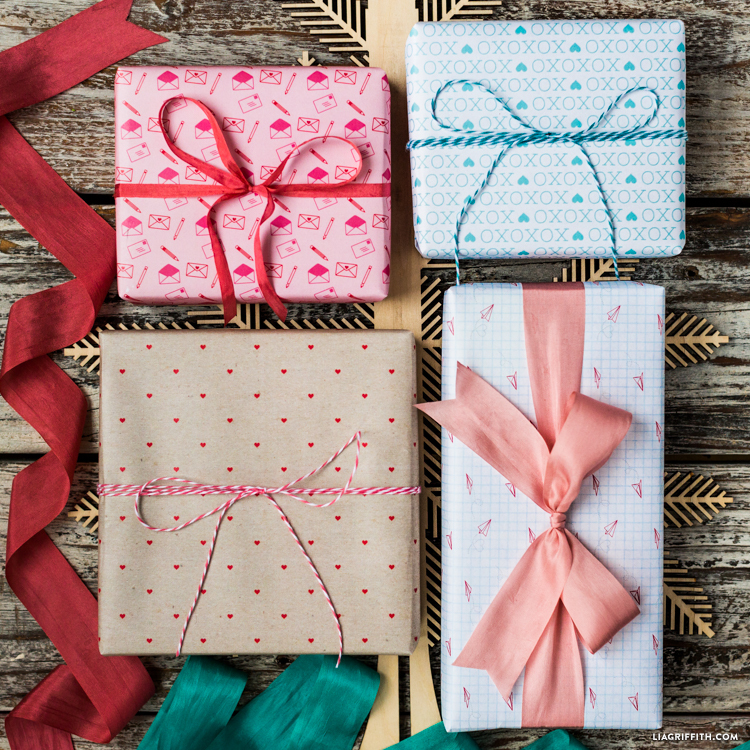 Print the PDFs for this Valentine’s Day gift wrap set on 11 x 17” printer paper and you are ready to go! This set comes in a lovely variety of soft tones that would be great to use for anniversaries and birthdays as well. Try pairing it with our Air Mail themed valentines for an irresistible vintage feel. For a French touch, check out these black and pink watercolor valentines. Tres chic! Please advise how i can get these lovely valentine papers, fell for them, really!! You simply have to print them on 11×17 printer paper and you are ready to go! So wonderful,thanks so much. Think might just print these out to make envelope liners or make envelopes with. The aqua with xo’s is my very favorite, so colorful and happy looking. Will make cards for other loved ones besides hubs. You guys are so awesome. Have pt tomorrow a.m so better do more exercises. Can finally lift my arm up to hold for little bit anyway, that’s an improvement over last week. My pt guy is awesome. So glad to hear physical therapy is going well and successfully! The blue xoxo paper is my favorite in the set too 😉 It would be so cute to use these as envelopes and liners!